Interested in creating your own Custom Coloring Book? 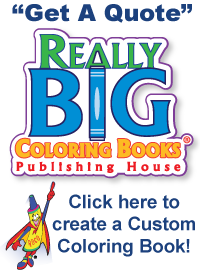 At Really Big Coloring Books ® we offer several product lines and book sizes from which to choose. 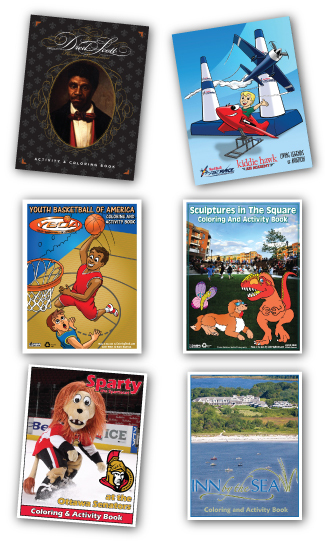 Our coloring books are printed in the USA and we manufacture coloring books at the best competitive rates! Coloring Book Publishers participates in Green Technology that is friendly to the environment with soy inks, recycled paper and the sustainable forestry initiative! When Coloring Book Publishers designs a custom book for your organization we can provide full service such as: graphics, editors, writers, artists and all books are reviewed by educators or professional's of that subject matter. We make it simple and stay within your cost guidelines. 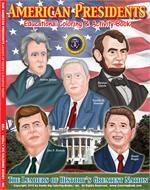 Coloring books designed to reflect your idea, business or community. Want a fantastic Custom Coloring Book designed all about you? Just fill out the form below and let us know what type of book you want! We will call you back ASAP or call us today at 1-800-244-2665. *To view more custom coloring books we have created for others, check out our other website ColoringBook.com please click here. ColoringBookPublishers.com does not share any information with others! Need a quote on a book? Please provide us some information about your coloring book, including Organization, Name of book, Subject of book, how many pages are in the book, who will do the artwork, how many copies do you want published and when do you want the book delivered? What will the Coloring Book be about? What type of bindery will be used? Do you need an ISBN or barcode on your book?